Buying coins successfully requires no more than a good knowledge of coins and the coins marketplace coupled with substantial effort. One channel for buying coins is through an established, reputable coin dealer. 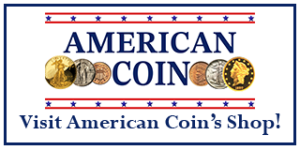 American Coin is an established coin store with a real walk-in location. We’ve been here for many years, and we aren’t going anywhere. Our chief numismatist, Dave Hur, is experienced in all aspects of the coin business, particularly authenticating and grading coins. Dave has worked successfully with various grading services for a long time, and has a years of experience with what to look for with coins. We are here to help you in any way we can. Our extensive inventory features many exceptional coins. If you are looking to make a purchase or investment, we have a considerable selection of coins in our catalog. If you are looking for something specific that is not listed, we may have it anyway. Please just ask us. All of our coins have pictures available and we provide a 7 day return privilege with every coin. Feel free to make us an offer on any coin. Buying coins is easy, right? Just find your local coin shop, go over to the shop and find something that catches your eye, and then buy it. This is a very common way of purchasing coins. Even coin dealers occasionally shop their competitor’s stores on behalf of their good customers and to try and find the occasional bargain. Of course, there are some advantages to dealing with a coin dealer. A good coin dealer knows the needs of his customer. He is constantly seeking the coins the customer desires to collect. He knows how to authenticate and grade coins accurately. He can help educate you about coins and their attributes. Above all, a good coin dealer earns your trust over time. Most coin dealers will knock a bit off a price if you ask. Typically, simply asking will save you 2-5 percent, so it is well worth the trivial effort. I recommend that everyone spend some time at the local coin shop on occasion. You can learn quite a bit hanging around the shop, but in addition, you can cherry-pick under-graded coins, unattributed errors, and varieties. Again, knowledge is key to buying coins at a good or even fair price. Auctions are a great way of buying coins, if you are knowledgeable. 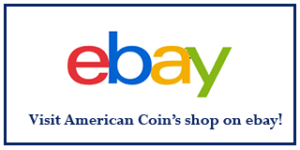 Every auction has bargains, and if you know how to recognize them, you can pick up good quality coins for a low price. The key to successful auction buying is preparation. View the coins prior to the sale, know the variety, grade, etc. of the coin prior to bidding on it. Don’t blindly accept the auction house’s grade any more than you would a dealer. Be careful on grade, even with slabbed coins. NGC and PCGS have made their share of mistakes as well. It is also important to have a price set in your mind beforehand for each coin you wish to seriously contend for. Don’t bid more than this set price, as auction frenzy can be as addictive as gambling. The adrenaline rush is your worst enemy. If you find yourself with buyers remorse after an auction, you may want to abandon this channel for buying coins and join a 12-step program! You can participate in the most auctions without going, but there is benefit to being there in person and examining the coins. One big advantage of participating in auctions is the catalogs. They have lots of good information, and often have tremendous pictures of astounding coins. Nobody can afford to buy everything, so auction catalogs provide a good record of what has happened and provide material to drool over. They often have a good deal of information about the coins. In some cases, auction catalogs are the only source for some good numismatic information. Mail bid auctions are an interesting phenomenon. They are usually closed auctions (meaning that you don’t know what your competitors are bidding). So your offer has to win or loose on your first bid. Some mail bids have weird rules. For example, sometimes they split the difference between your high bid and the next highest bid. This gives you the idea that you may not pay quite as much as you bid. Don’t buy it. You will pay very close to what you bid every time. Check the return policy carefully. Note who pays for the mail in the case of a return. You need to know how to grade coins to effectively participate because you won’t see the coin until you win and it is sent to you. In some mail bids, I just assume that the coin is a grade lower than stated, and bid accordingly. Often I win because others have learned to do the same thing. 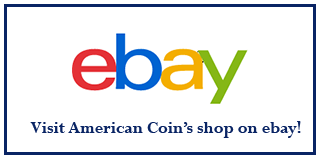 Bidding in an e-mail or online web-based auction can be a lot of fun. They are usually open auctions in that you can see the price go up over time. Most of these auctions go over a period of a week or two. The better ones will e-mail you when you’ve been outbid. Some also allow you to input a maximum bid so that the price goes up automatically. As with all mail order, make sure they have a liberal return policy. Since there is a new online coin auction coming up every week (or so it seems). You can end up spending a lot of time just looking for the coins you want in these auctions. More often, however, many sellers set a price on the large online shopping sites like eBay, Amazon and Yahoo. The most obvious example of this was Teletrade. They sent out a catalog for two auctions a week. For buying ultra high grade moderns, they had the most material of any other phone auction. However, their site has been down for some time and many phone auctions have closed down as online and email auctions continue to grow. When local coin shops have bid boards, this provides a method for buyer and seller to meet without being in the same place at the same time. This is a very effective way of transacting coin business. The only downsides being that you actually have to deliver your coins to the shop, and that the dealer has his small cut of the profits. Shows are another great way of buying coins. There is a great variety of material in one spot. You get to look at the coins before you buy. You have extra ammunition to haggle effectively. Here you will find the vest pocket dealers that don’t have the overhead associated with a physical store. These guys are knowledgeable, helpful and usually quite friendly. The smaller and more local the show, the more likely you are to get good deals. If the dealer has to travel to Long Beach, he has to pay for the trip. Also, the low overhead dealers can’t afford to go that far for that long, they usually have a day job. Shows are also very fun. You can make lifelong friends attending coin shows over time. Even if you don’t purchase or sell coins at shows, going can be a lot of fun. If you enjoy coins, there is no better place to be. 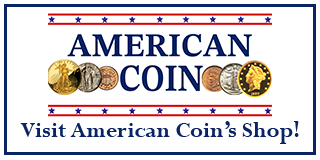 You can generally buy coins directly from other collectors at coin clubs. Although the selection is not generally terrific, this is clearly the most cost effective way to both buy and sell coins. Particularly if the club doesn’t charge to set up tables at the meeting. In a sense, American Coin on the Net is a big clubhouse. This is exactly the feeling we hope to achieve for buyers and sellers of coins. If we succeed, this will be the best place to meet collectors with whom to buy/sell/exchange coins with.